This large, high density baling press with 30 tonnes of pressure reduces waste by up to 90% and is suitable for a number of different materials, including cardboard, shredded paper, shrink films, etc. 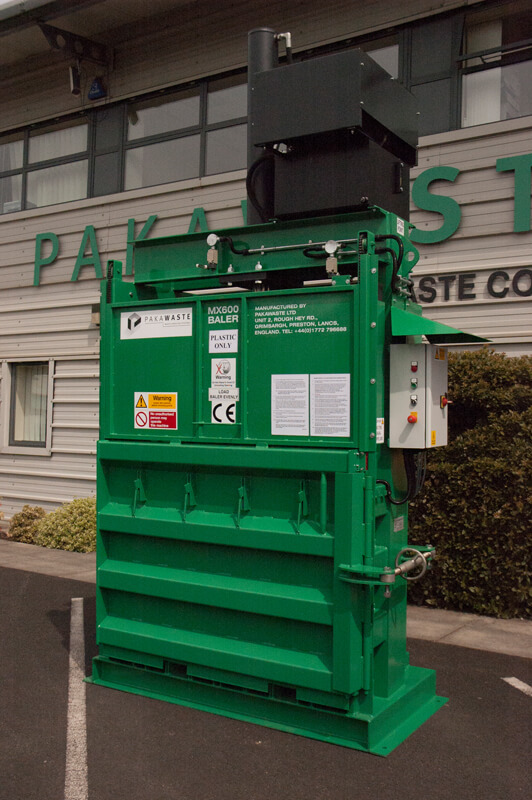 Our MX600 Vertical Baler produces mill sized bales which can be taken away by a wastepaper processor to provide extra revenue for the company. The baling press has a lifting mechanism for discharging the bale directly onto a pallet for ease of use. Waste retention teeth are fitted preventing spring back of material to guarantee maximum bale weights are accomplished. As well as that, the press produces compaction with up to 30 tonnes of pressure (300 KN). The MX600 is manufactured according to CE standards and is BSEN16500 compliant. For more information our MX600 Baling Press, please contact our specialist team today.